Preparation time: 15 minutes. Baking time: 40–45 minutes. Preheat oven to 375°F. In a large bowl, place blueberries, blackberries, lemon juice, 6 tablespoons Splenda, and 1/4 cup flour; stir gently to combine. Transfer to an 8” x 8” baking dish coated with cooking spray. In a small bowl, stir together 3/4 cup flour, 2 tablespoons Splenda, brown sugar, and cinnamon. Cut in margarine with a fork until mixture is crumbly. Stir in walnuts and sprinkle evenly over fruit mixture. Bake 40–45 minutes, or until topping is golden-brown and fruit is bubbly. Portion into 9 equal servings. Serve warm. Serving size: 1/12 of pie. 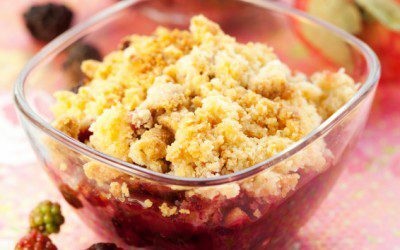 Exchanges per serving: 1 starch, 1 ½ fruit, 2 fat. Carbohydrate choices: 2 ½.